I don’t have much of a sweet tooth. Given a choice of a good vegan pastry or, say veggie sushi as a yummy snack, I’d choose the sushi. Or spring rolls. Or stuffed grape leaves. Don’t get me wrong. I wouldn’t turn away a great vegan dessert, but it’s not something I clamor for. So for a vegan baking book to win me over, it’s got to be really good. The baked goods need to be easy to make, delicious, and filled with real food, not just veganized versions of white flour, sugar-filled fluff. The last thing I need is empty calories. 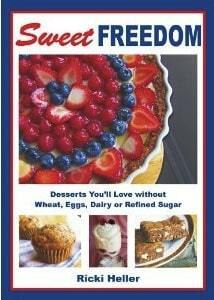 Sweet Freedom: Desserts You’ll Love without Wheat, Eggs, Dairy or Refined Sugar* by Ricki Heller fulfills all my requirements for a great vegan baking book. It’s that good. I’ve already made several recipes from this book, whose star shines ever more brightly in my esteem by providing recipes that are as easy as they are tasty. Aside from being perfect for vegans, this book is a great resource for those with food allergies. Though many of the recipes use spelt flour, which is not entirely gluten-free, there are many others that are free of gluten, and are thus designated with a symbol. Those who avoid dairy will find the entire range of recipes at their disposal. Though tree nuts are used here and there, similarly, there is a designation for nut-free recipes. All manner of baked goods can be found here, including: Muffins, scones, cookies, bars, cakes, cupcakes, cheesecakes, pies, and more. There are toppings and frostings as well as an entire chapter of raw and no-bake treats. Among the recipes I’ve made so far are: Banana-Chocolate Chip Mini-Loaves; Carrot Snack Cake (which I topped with Cashew “Cream”), Butterscotch Blondies with Chocolate Chips and Dried Tart Cherries, Ultra Fudgy Brownies (see following), and, just this morning, Banana Nut Muffins. Though ingredient lists are not necessarily short, the methods are as easy as can be. I love the index, which makes it very easy to find a recipe that suits a major ingredient or a type of recipe. Say you want to use barley flour, voila, there is a list under a bold header for Barley Flour. Or say you have some bananas on the counter which, if you don’t use them this minute, you may as well compost them. Under the bold header Bananas you’ll find several tempting recipes to save your bananas from such a fate. Despite my lack of a wicked sweet tooth, I do like to bake and make these kinds of treats for my husband, sons, and family. Though you’ll see when you click through to Amazon.com* to find out more, you’ll see that the book is a bit pricey, I truly believe it’s worth every cent, as this is a book you’ll find a tremendous resource if you have dietary restrictions, or if you simply prefer that your treats contain substantial nutritional value. Sweet Freedom is also a trove of ideas for school lunch and after-school treats. And home-schooling families will enjoy making these together as cooking projects. Hooray for Ricki Heller and Sweet Freedom! * Visit Ricki’s web site, Diet, Dessert, ‘n Dogs, for more great allergy-friendly recipes. Ricki’s brownie recipe is already a favorite here in my home. I love the idea of adding avocado! Once baked, you don’t know it’s there, but it adds richness and contributes to the fudgy texture. Please note, the book also contains metric measurements, which I’ve left out here. Click here for Ultra-Fudgy Brownies.